After a 3 month primary brawl, using almost 5lbs of sugar, I cracked 20% and created a beast of a beer! After breaking such a massive barrier I'm briefly sneaking out of my blogging retirement to tell the story of how it came to be. The road to what became Westbennetteren 20 was a long and winding one. It started in 2013 during an evening of beers and games. I clearly remember at least two of the people at the table being Daniel Fernandez (of Beancurdturtle Brewing and BCT Brewing Project fame) and Miklos Somogyi. During the evening the subject of quads came up and we had a discussion on the evolution of the trappist styles along with what the next logical step would be. Logically the argument was for it to be called a Quintuple (or The Quint as Miklos would refer to it over the next few years) and be in the mid-teens abv wise. Over the next few years I would think about brewing it, even occasionally putting it on deck. During this time I would toy with the recipe trying to think both of what I wanted it to be and how I would push it into the abv range. One of my initial recipes had doubling the amount of candi syrup I use in the boil for Westbennetteren 12. During this time I firmed up in my mind that this beer would be more of a supped up quad than anything else. Eventually I moved away from just trying to overload it with candi syrup in the boil and instead moved towards step feeding it pure dextrose in primary. 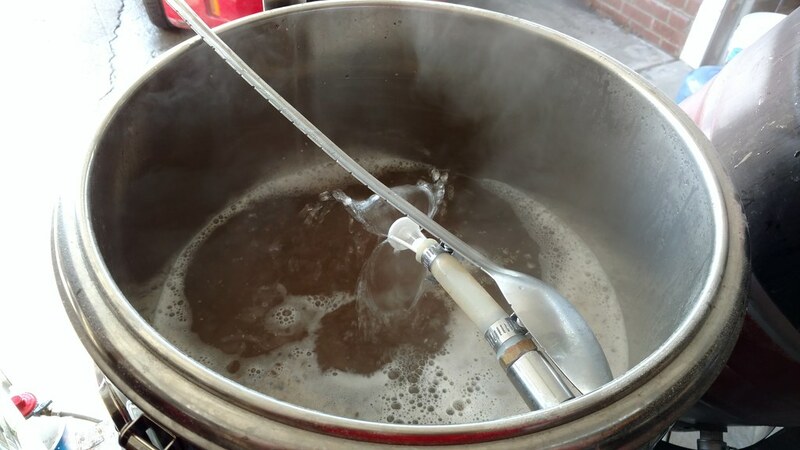 This is the technique used in brewing Black Tuesday, 120 Minute IPA and several others. I ended up adapting the methodology Scott over at Bertus Brewery used for his DogFish 120 IPA clone with the base recipe being my Westbennetteren 12. Additional notes on brewing massive beers. With the recipe firmed up and after two back to back years of disappointing batches of Westbennetteren 12 (b3 stalled fermentation followed by a slight infection, b4 flat) I decided that the time to brew the quint had arrived. On Sunday, March 6, 2016 I set out early in the morning to brew essentially Westbennetteren 12 for the fifth time. Overall it was a smooth brewday. After some discussion on brewday and thinking about it in more depth I've decided that Westbennetteren 20 isn't a Quintuple after all, it's actually something more. To start with let's take a look at the progression of "trappist" style beers. Fermentation started out fine and within a week it had gone from 1.113 to 1.024. At this point (14 March 2016) I pitched the first starter of WLP099 (Super High Gravity Ale Yeast) along with 12oz of dextrose and some pure O2. My plan out of the Bertus methodology had been to pitch 12 oz of sugar morning and night till it slowed down then moving over to 6 oz additions till it reached the target range. The expectation is that the yeast consumes the sugar at a rate equal to what you are adding. I would check gravity nightly using cleaned and sanitized equipment so that I could add the samples back after measurement. It became clear pretty quickly that I was adding gravity points faster than the yeast was consuming them. For the 5th addition I moved from 12oz to 6oz to see it that would help, it didn't. During the first 5 days I'd added 54.2 oz of dextrose with the gravity increasing to 1.041. So while it was consuming the sugar, gravity would have been up to 1.051 if it hadn't been, it wasn't consuming it nearly fast enough. At this point I stopped adding sugar and moved gravity checks to every couple of days. My plan was to resume adding sugar once it reached 1.026. Alas it completely staled out at 1.030 for over 3 weeks. 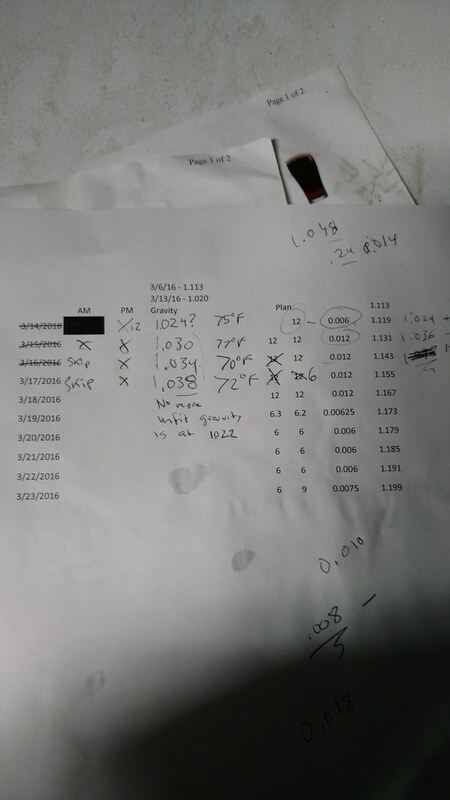 At this point the accumulated OG was 1.140 and calculated alcohol only 17.1%. Too low for me to stop yet not to mention at 1.030 was a little too sweet. To kick it back into gear I ended up repitching twice - the first was another starter of WLP099 with an additional 12oz of sugar. Unfortunately it didn't get very far and ended up stalling for another month at 1.035. Not long after, during a meeting of The Fellowship of Tao Brewers at my place we sampled it and discussed my plight. Afterwards I took in all the advice I was given and formulated a cure for my situation. The cure consisted of pitching a liter starter made with 2 packages of Champagne yeast and several capsules of Servomyces. At pitching I also included another couple capsules and some fresh O2 for good measure. I took gravity a couple of days later and it had dropped to 1.026 ~ 18.7% abv. With some solid fermentation progress I decided resume slowing feeding it another 12oz. 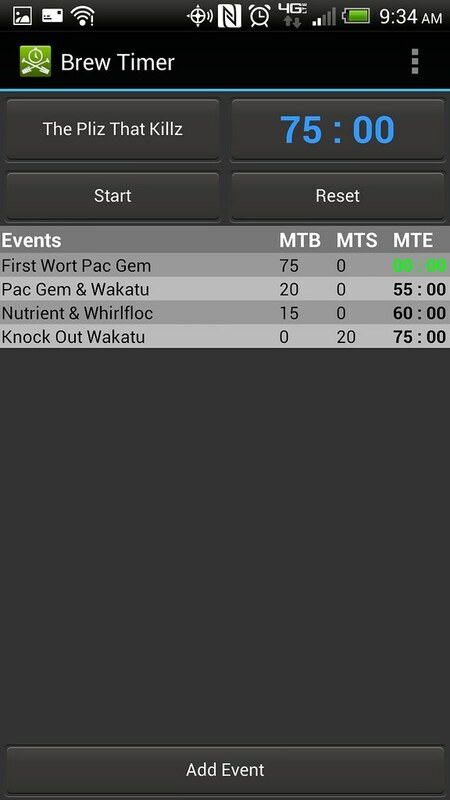 This took me to a accumulated OG of 1.152. On June 11th, just a touch over 3 months since the brewday, it hit 1.020. After some back and forth texts with Shawn I set the fermentation chamber to 30°F to cold crash the yeast and stopped the fermentation! 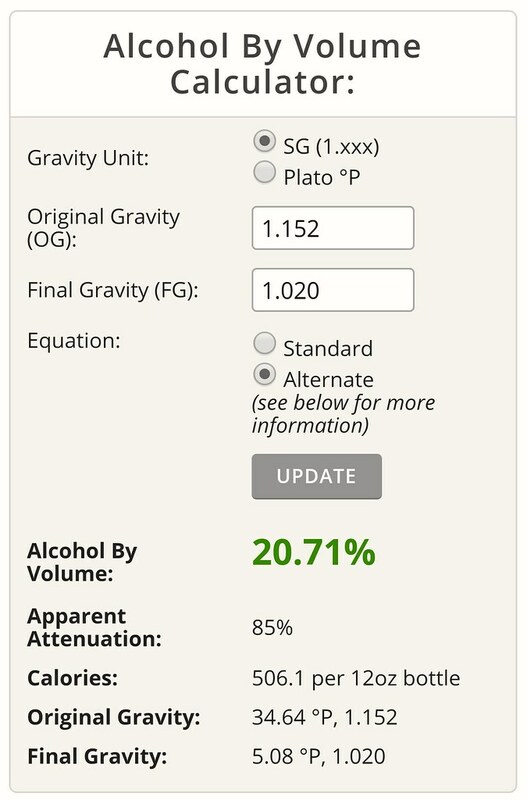 Using the advanced gravity formula 1.152 to 1.020 came out to be 20.7% abv. I lagered it for 2 months to help it clear before I forced carbbed it for bottling as I didn't have any confidence it would bottle condition. The last change I made from Westbennetteren 12 was to change the color of the cap. With Westbennetteren 12 being directly inspired by Westvleteren 12 I'd always used gold caps from Bottle Mark. For Westbennetteren 20 I optied to go with SNB "house colors" of red and black, a combo that worked within the existing Green Blue Gold Westvleteren cap color scheme. - More hops to help counteract the sweetness. My last real post (not counting the "Not Dead - Just Busy" update) was February 11, 2014. In the last year I probably started a half a dozen posts ranging from my friend Curtis opening one of the best new breweries in SD - Council (seriously it's awesome and you should check it out) to QuadFest 2014 (which really should do since I own QuadFests.com) to random brewing things. Starting them was easy but figuring out where I wanted the post to go or what I wanted it to say wasn't. My "explorations" always seemed to follow the same format, QuadFest 2014 was a great event but what could I say about it beside that it was in different setting than 2013 and writing about another brewday took time I could no longer justify spending. 2014 was a very hard year for me from a personal standpoint and extremely busy one professionally. This lead to not having the extra time needed to devote to blogging about beer. In total I brewed 14 beers for a total of 85 gallons, which, amazingly, is an increase over 2013's 11 beers worth 66 gallons. 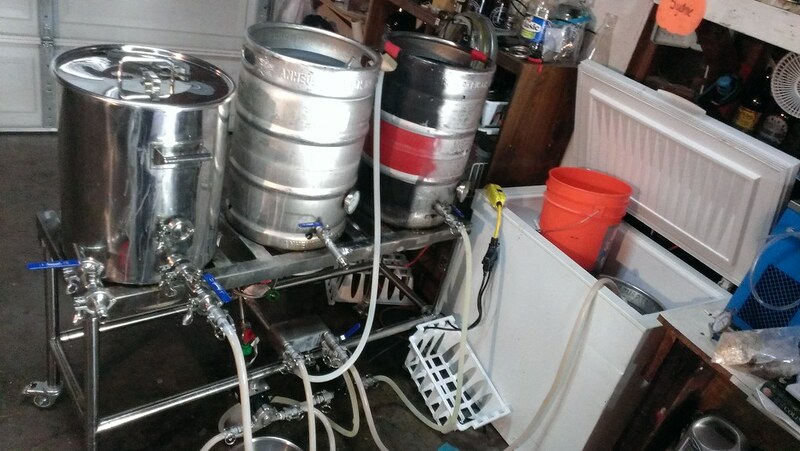 Using my new system I was able to produce 3 10 gallon batches including 10 gallons of my annual birthday beer which I plan on racking into an 8 gallon spirit barrel in the fall. 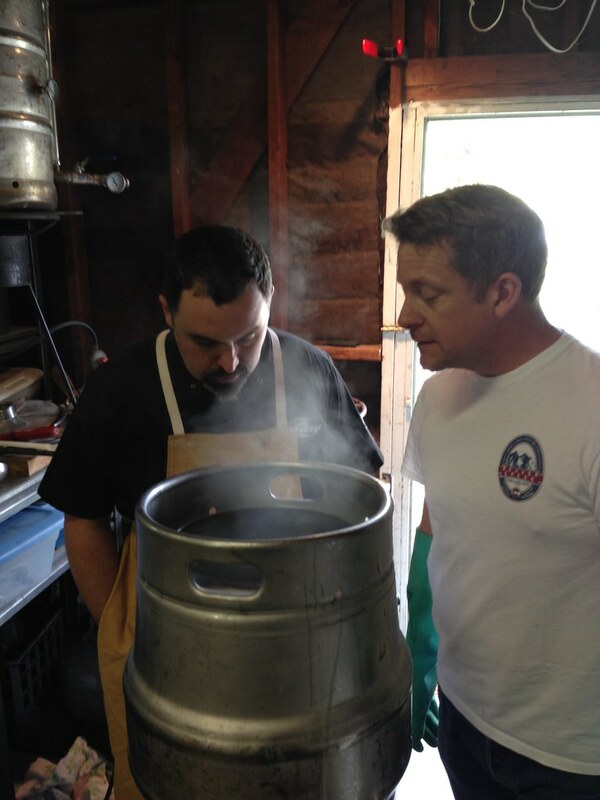 We also brewed 2 recipes inspired by our 2013 trip to Hawai'i, Black Sand Beaches and Hawai'IPA. Black Sand Beaches was conceptualized by Bonnie and is a schwarzbier (dark lager) with 24oz of toasted coconut added to the whirlpool with an oz of Amarillo. It is absolutely a fantastic beer and we are gearing up to brew a third batch of it as well as an imperial version dubbed Ja Booty (which will include Maui Vanilla beans). Hawai'IPA (12oz of toasted coconut, Mosaic, Citra and Amarillo Hops fermented with Vermont Ale Yeast) still needs some work. The SNB Brewhouse v4 continues to crawl towards completion. At one point everything was put together however I had trouble getting the PIDs to open the valves so I took them off and have been running manually since. I just haven't had time to troubleshoot the electrical with the guy who did the wiring. I continued to have fun adding my logo to various products (hats, jackets, bags etc) which have been a hit with my friends. 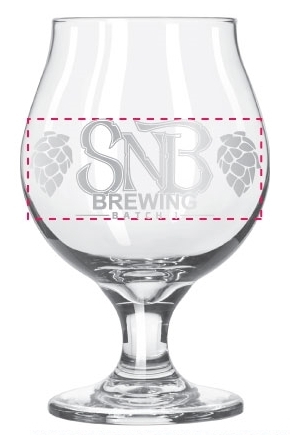 Hopefully by the end of the month Batch 1 glasses will arrive marking the debut a tweaked SNB Brewing logo which I'll use going forward till 2018. With all that said I should probably mention that this will be my last post for a while. I'm going to continue to brew and update the Facebook page but not this space. 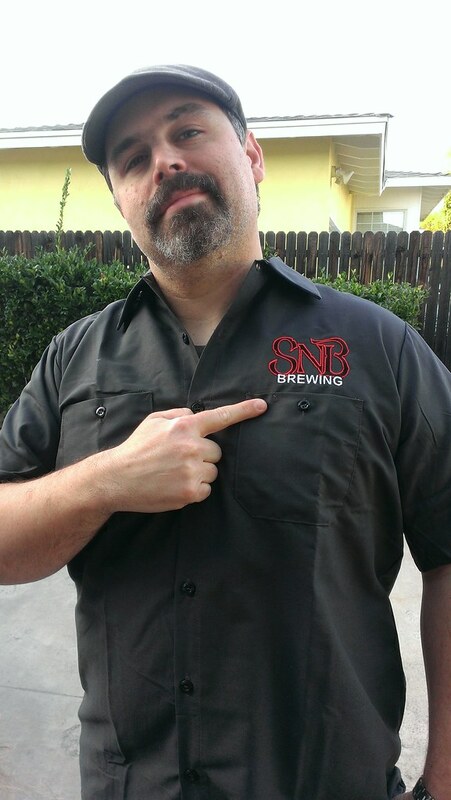 On April 1st 2011 I found out that I had I won the Karl Strauss ProAM, later that day Angelo (one of my employees at the time) encouraged me to buy the domain SNBBrewing.com, which I did. 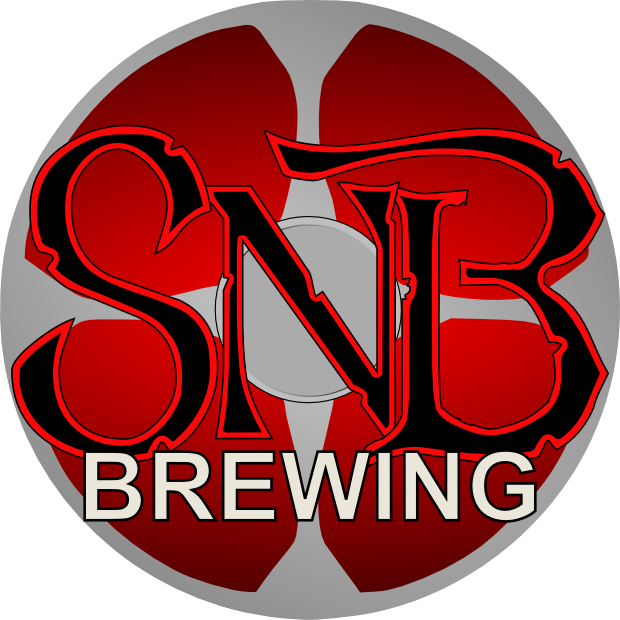 It took me a little over three months to decide what I wanted to do with it but I eventually decided to do a blog so on July 20, 2011 I published my first post Welcome to SNB Brewing launched this blog. I had a lot of fun writing about my love brewing and beer over the years but all of that had to eventually come to an end. For the past few months I've been at a crossroads with what to do with this blog, let it die or bid it farewell. In my heart I had realized that for the most part I'd let it die do I decided to update one last time and actually say goodbye to the world of beer blogging. To those out there that visited - thank you - you put up with some of the worst proofreading / grammar / punctuation / run-on-sentences in the beer blogging game and still came back. Our Saga isn't over, its only just starting just not here. The blog is not dead, just dead tired from work. 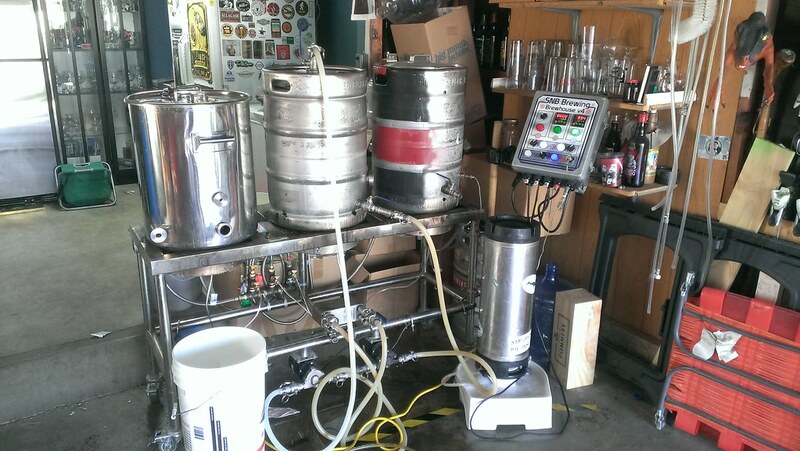 I've been doing a lot getting the new system up and running as well as inventing new style of beer. I'll come up with a catch up post soon but in the meantime here's some picture of what I've been up to. I’m so far behind on posts that this one is going to really cover three topics. 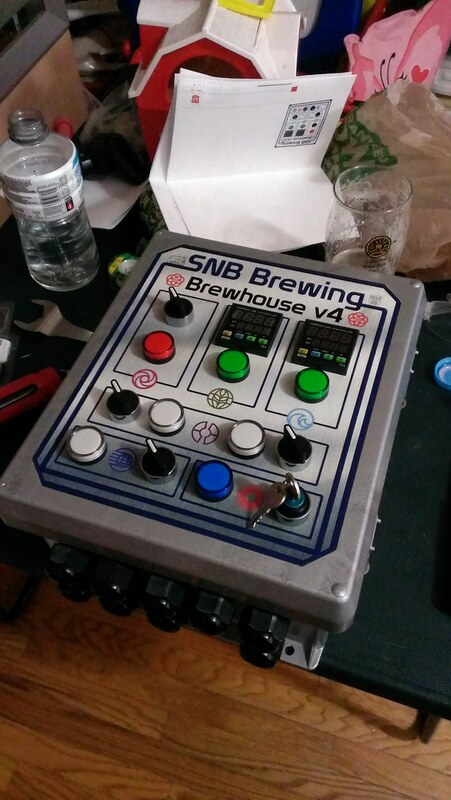 The main topic will be the construction and testing of my flat brewing surface currently known as SNB Brewhouse v3.5. The other topics that will be lightly touched on are BSS aka Bitter Sweet Symphony Remixed and 35ish my annual “birthday” brew based on Kate the Great. Grouping all these together actually makes sense as they are really all part of figuring out how to brew on a flat surface. 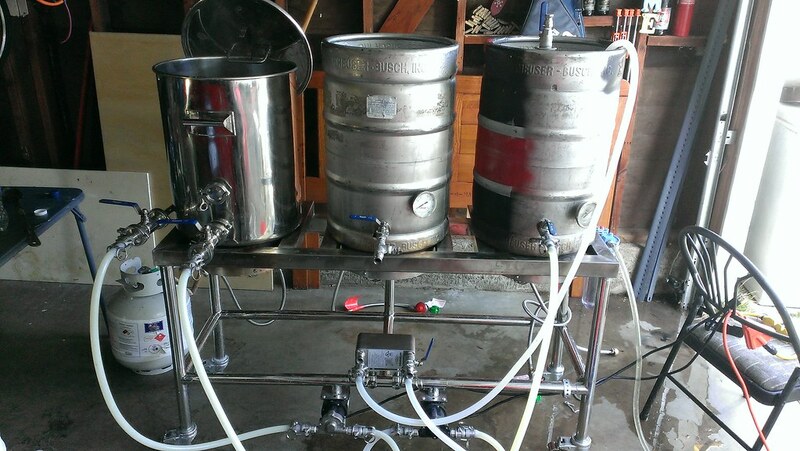 It had been almost 6 months since I’ve brewed a beer at my own house. This was mostly caused by me stripping my previous system for parts for a new system while waiting for a flat brutus style stand to be built for me. 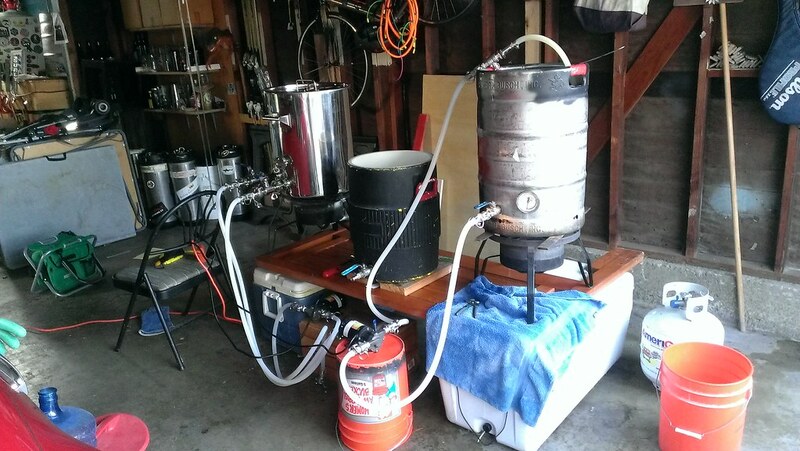 Almost a month ago I got tired of not being able to brew at my house so I jerry-rigged together a brewing setup (dubbed Brewhouse 3.5) using my old headboard and pieces from my various set ups. 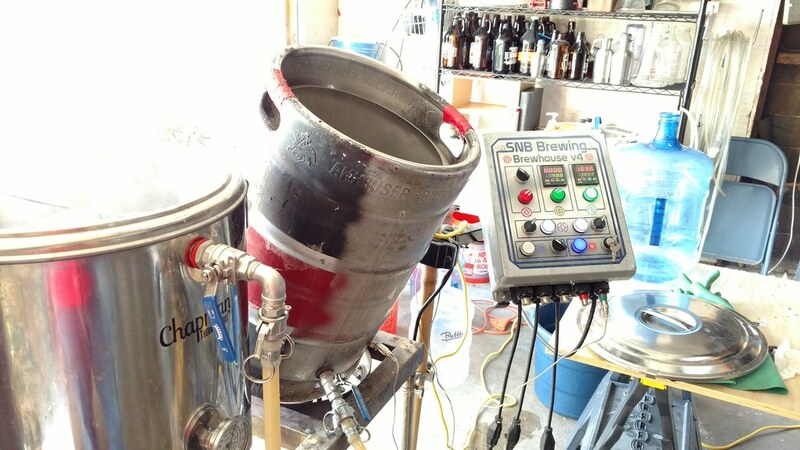 It was pretty fun building a new manual flat surface brewhouse. I’d been playing with pumps before to move water and wort to different places but always had the ability to use gravity for certain steps. Going to a flat surface meant learning how to move liquid exclusively with pumps. To do this I needed to upgrade my hoses and connections to make moving wort more efficient. On the connection side I looked into the one handed quick disconnects and triclamps but decided to go with cam & groove fittings similar to the ones Shawn uses. The side benefit is when I brew with him I don’t have to worry about modifying either setup to get them to work together! For this setup I relied heavily on Brewers Hardware for a great selection of fitting, included the wide bore 1/2" Cam and Groove Coupler X High Flow 1/2" Hose Barb. The other thing moving to a flat brewing setup meant that I would need to finally transition from batch sparging to fly sparging. I’ve been batch sparging as long as I’ve been all-grain brewing mostly because I didn’t have a HLT, well I had one (which will make its debut as a mashtun in Brewhouse 3.75) cut and drilled I just didn’t have it setup with the hardware. 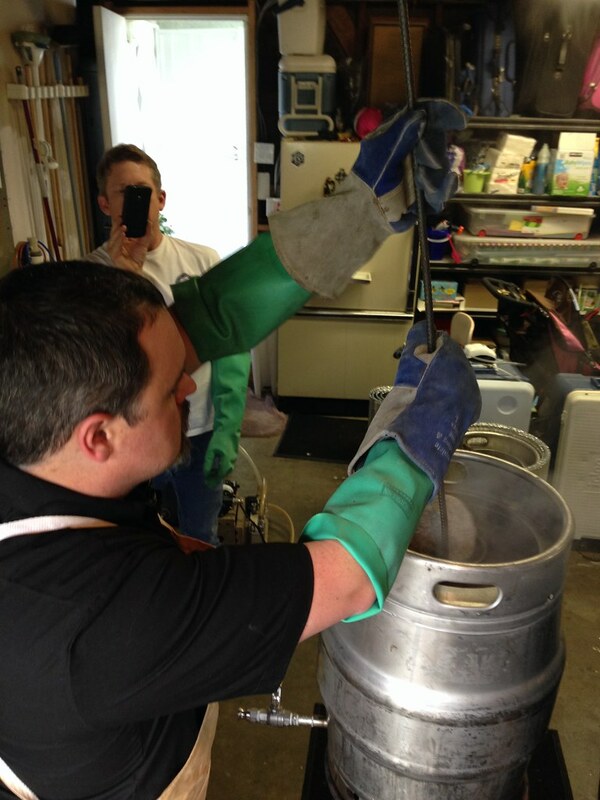 Part of both learning to use pumps more efficiently in brewing and fly sparging meant valves valves and valves. Whereas before I only had 2 I now have valves of all shapes and sizes. Using them all really gives the feel of working in a larger scale brewery. 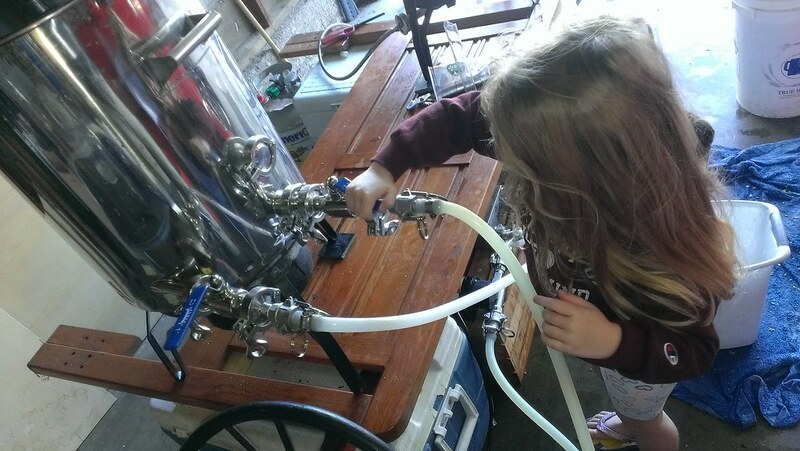 It was also fun to get my daughter to help open and close valves. Part of learning to use valves was learning where to put them in reference to pumps. Basically you never want to restrict the flow of liquid into the pump which means only placing valves after the outflow. The one disappointment about moving to new hardware was that the chill plate Bonnie got me for my birthday the previous year won’t work anymore. 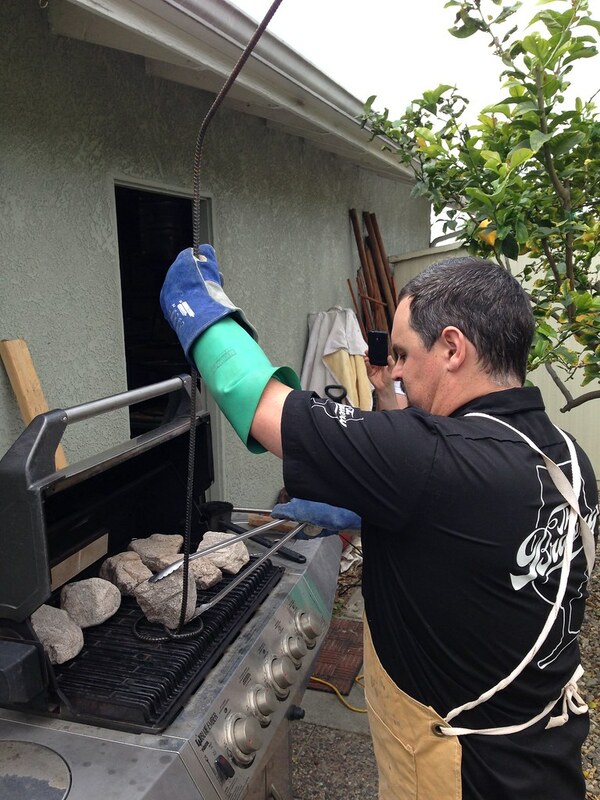 It was designed to work with a hose barbs and a garden hose neither of which I could really adapt in my new system as you’ll see from the pictures. I ended up selling it and a pump I only used for cooling water to my mom and stepfather. I used the proceeds to buy a new larger 40 plate heat exchanger straight from Duda Diesel with 1/2" Male NPT to attach new fittings and a ball valve directly to it. 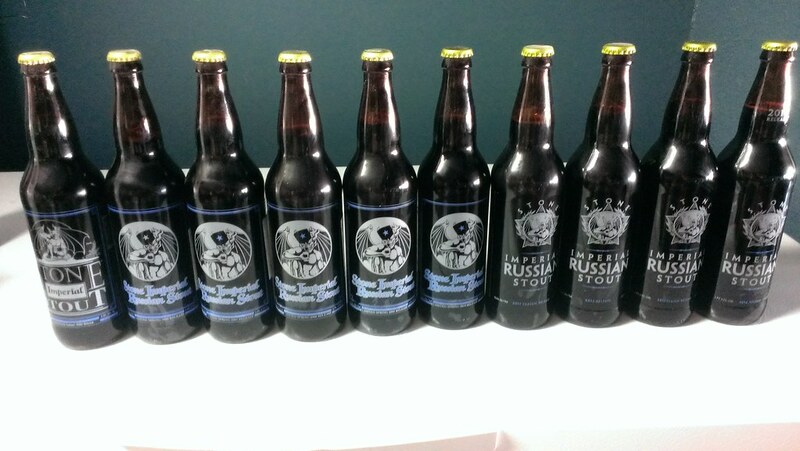 Before I jet, let me briefly talk about the two “calibration” beers BSS and 35ish. BSS is the codename for Bitter Sweet Symphony Remixed which is a rebrew and retool of Bitter Sweet Symphony from last year. I wasn’t happy with how it turned out as a lager so I switched it to WLP007 and changed the rice to brewer’s sugar. Currently it’s on a strange journey that I right now don’t know how it will end up. 35ish is my annual birthday brew based on the Kate the Great recipe. It gains the “ish” this year as even though everything was set and ready to go on my birthday I wasn’t “physically able” to brew that day getting around to it a few days later on the 1st of January. It’s currently in a keg for a long cold secondary. 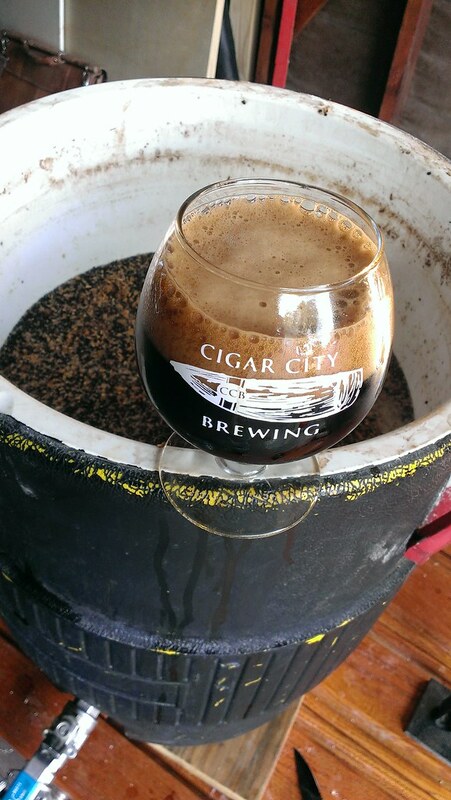 Last December (of 2012) I wrote a recap of QuadFest 2012, a get-together tasting that my friends Daniel, Shawn and myself had a put together in order to try a series of quadruples that we had brewed at the start of that year. We all felt that it was a very fun and successful event that we wanted to do again next year. We also decided that we wanted to expand the field of participants by extending invitations to brewers whose beers we've enjoyed in the past and run it through our Fellowship of Tao Brewers Google group. We presented the idea of QuadFest 2 - the Quadening, along with a style presentation on brewing quadruples at the January meeting of Tao. It was met with a lot of positive feedback and interest so I started a new discussion topic for QuadFest 2013 the next day. 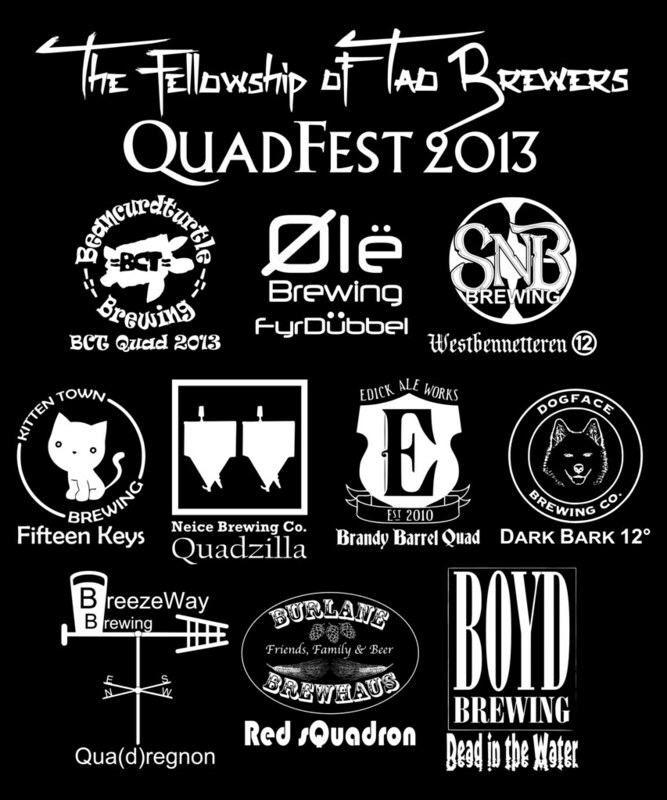 The guidelines for new participants were very simple; brew a quad that quarter (sooner the better to give it time to age), bottle it in later summer, come to QuadFest 2013 and have a great time. There was no set recipe to follow but I included the presentation on quads with some “tips” along with my recipe for Westbennetteren 12 b1. I still think the recipe would be incredibly easy to convert to extract. We used the thread all year as a place holder for recipe development, feedback, advice and planning. As QuadFest 2013 approached I scrambled to finish some pretty slick participant shirts giving them free range over color and logo set (I had started over the summer but my new job zapped my time). 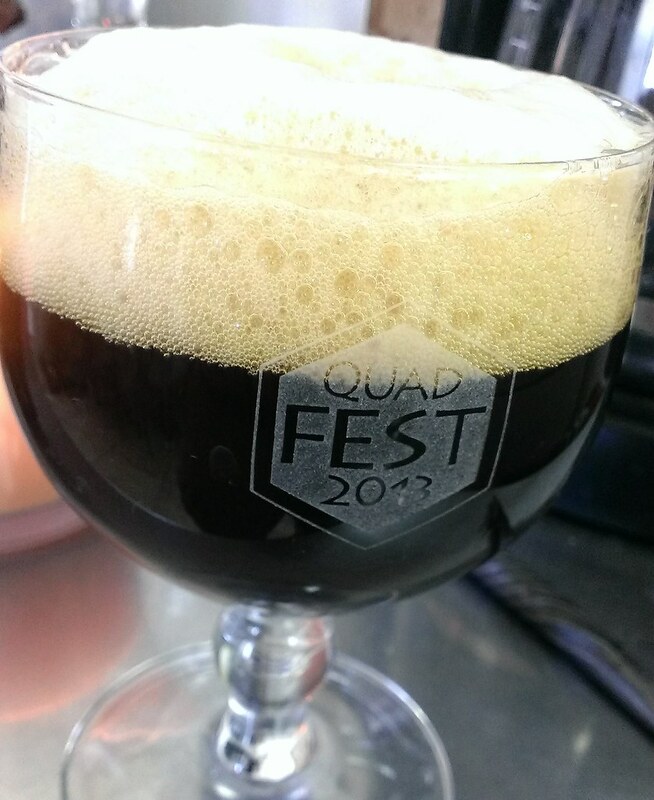 Daniel also had a set of chalices made with both the QuadFest 2013 logo and the Fellowship of Tao Brewers logo. The chalices came out incredible taking the silly seriousness of QuadFest to the next level. Once more the Globe hosted us and ended up reserving front tables just to fit us all in as we ended up increase participation to 10 quads and expanded the number of people in attendance to 18 which for once included my wife which made me very happy. We divided the quads into two flights; Classic (pils/2-row with candi syrup) and Belgian Dark Strong (inclusion of specially malts). Before each one Daniel presented a commercial example for calibration. 10 excellent quads from 10 excellent brewers, each one was nicely executed and delicious but still 10 quads… So where do QuadFests go from here? I’m concerned that we might have outgrown the Globe for next year as we continue to expand. In addition sampling 10 quads is a tough job but I think with a more structured setup we can maybe handle about double that many next year. 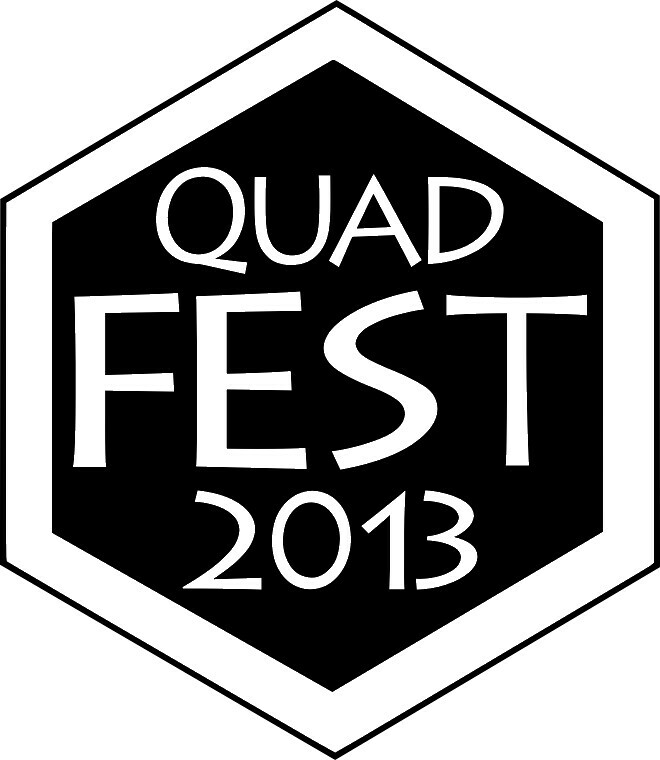 Next year I see QuadFest 2014 going through another expansion in its original format, but with a few slight changes: Early requirements for how much will be needed for QuadFest (3-4 x 750mls) for better planning come bottling. Set the date further in advance, possibly over the summer. Find a new venue to allow for a more focused event with better lighting, I’m hoping we can convince Brad over at Peace to both participate and host. QuadFest 2015 will happen but only time will tell what form it will take. 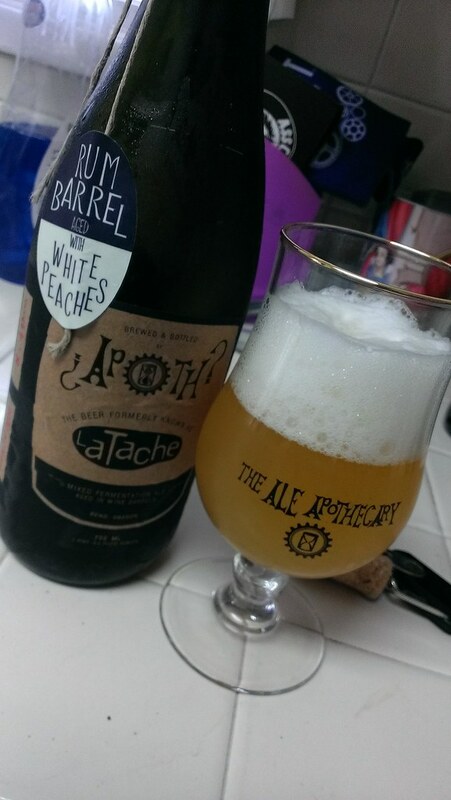 The road to this beer started several years ago when I first got heavily into beer. I can’t remember when I first learned of its existence but I right away knew I wanted one for my 35th birthday, which at the time was three plus years out. I know a couple of guys who have acquired them for their 40ths but at the time it seemed like too much of a stretch, now however I would consider another bottle just for that occation. Over the years I’d throw out an occasional ISO:FT but only got crickets. I even tried eBay off and on when you could still find beer on it, but I never caught a 1978 when it was available and was outbid on some close vintages (I thought I might be able to trade a 77 or a 79 for a 78). So after years of searching and with the 35th deadline quickly approaching I was finally able to set up a trade for one in exchange for a bottle of the recent release of Duck Duck Gueuze. The only hang up was that the bottle was all the way in Australia of all places. He asked if I’d be willing to wait till December as his friend would be in California around that time and could bring the bottle over with him. Considering it was the closest I’d been I agreed and started the wait. A lot happened to me in the interim time: I started a new job, got banned from BA despite never violating their terms of service (where the trade started), ate a lot of reubens, ordered a brewsystem, went on an incredible vacation with my wife to Maui, had the best Halloween ever with my daughter and drank hundreds of new beers. In the end we met up at Noble for a pint and exchanged a beer I’d been waiting years to get my hands on. 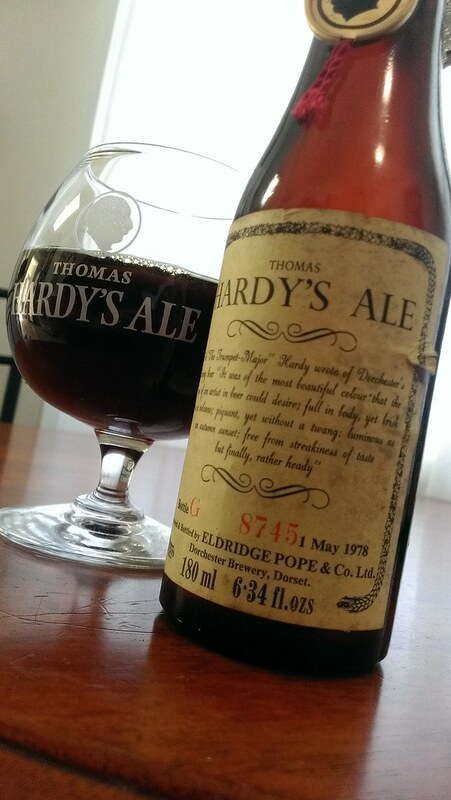 Appearance: Poured very carefully from a 180 ml 6.34 fl oz bottle numbered G 8745 and dated 1 May 1978. 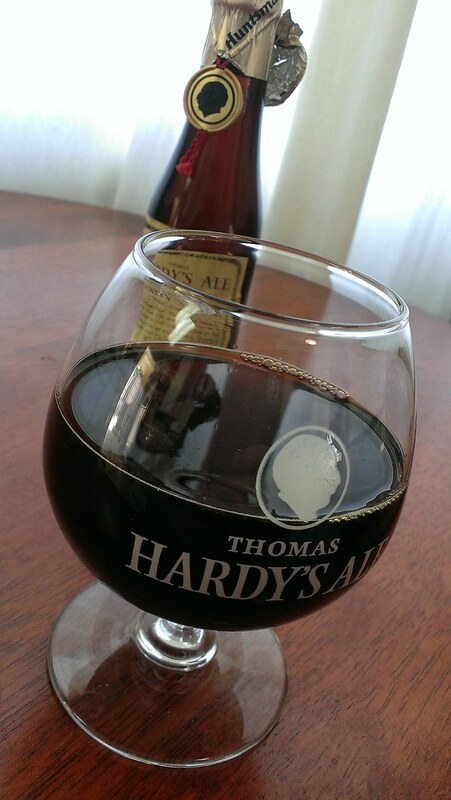 Pours near flat into a Thomas Hardy’s Ale Snifter glass sent to me by my friend Dan Cowell. Tiny little bubbles form on the surface of the beer some linger but most quickly vanish. Peering inside the bottle reveals that a black tarry sediment remains on the bottom. All is to be expected from a beer older than I am. It is crystal clear with a brilliant amber-garnet color. Aroma: Wow, talk about sensory overload. It smells hot (fusel), old and very musty probably from oxidation. Very reminiscent of port with leather and aged stone fruit accompaniment. There is some faint residual sweetness on the nose when I deeply inhaul. Bonnie swore it was barrel aged when she first smelled it and I can agree it has the presence that it could have been aged in port barrels with some type of fruit. Mouthfeel: Thin and very slippery with no carbonation detected, but I’m in no way surprised by this. The slickness coats my entire mouth. Taste: Very odd, nothing like I've ever tasted before. I get hints of port but it also has a very metallic taste to it like over ripe plums. There is a distinct tartness to it. There is so many things going on that I have never tasted before I have no frame of reference to compare it to. It is nearly impossible to distinguish what’s going on in my mouth. It gets crazy good as it warms and opens up you get used to what you’re experiencing. Overall: You really have to approach a beer like this with a completely open mind. 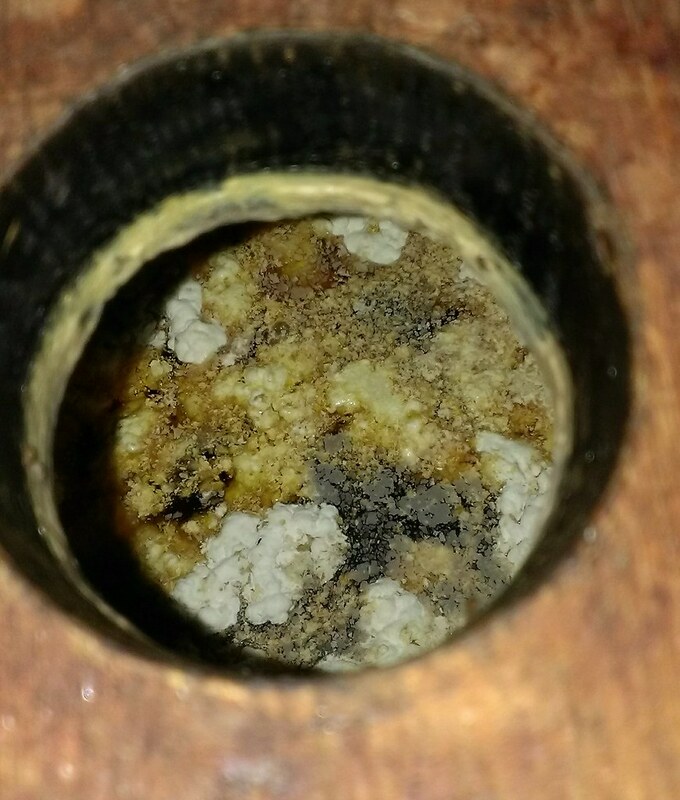 It was like nothing I have ever smelled or tasted before. Some beers get top marks due to taste alone while for others it is the experience that make them unforgettable. For this beer it is truly an experience I will not soon forget and a great way to toast my first 35 years on this planet. I would love to try another in 5 more years and possible with a 1978 Westvleteren 12. Meanwhile, I've been having the itch to brew as the last time I actually produced a beer was the last time I brewed with my mentor and good friend Shawn O on the Same Grain, Same Style, Different Brewer group collaboration which produced my Sour Citra Saison. Shawn and I had been talking for several months about going a Bohemian Pilsner using decoction, I even bought a sack of grain in August time frame just for it. Unfortunately scheduling the actual collaboration proved to be about as easy as building a brewhouse. When it was looking like we were going to brew in October I bought a vial of WLP800 (Pilsner Lager) to use seeing as how it had a mid November expiration, however by the time we nailed down a post Thanksgiving brewday I needed to buy another vial. Stock issues lead me to grab a vial of WLP830 (German Lager). High alpha smoothcone cross developed at DSIR in 1987. Used for: Bittering - produces a cask-oak woody flavor. Aroma: Pleasant - some blackberry aroma. Characterized by restrained floral notes atop freshly zested lime Description: Formerly called Hallertau Aroma. Similar to German Hallertau but Higher alpha. Excellent Dual Purpose hop, rounded floral aroma with hints of lime. Typical Beer Styles: Lager, Pils, Bock, Wheat, Kolsch, Helles, Belgian Ales. The one thing I really wanted to use was my new 15 Gallon Boil Kettle with Tangential Inlet I bought from Brewers Hardware back in October. The thing was an absolute beast! Once we sparged into Shawn's kettle we drained off half of it into mine and started heating. I was amazed at how fast it came to a solid boil. The tangential inlet also worked better than I could have imagined and after a 30 minute whirlpool had created a wonderful island of trub in the center of the kettle. I'm really looking forward to trying this one in a couple of months and can't wait till my brewhouse is completed. 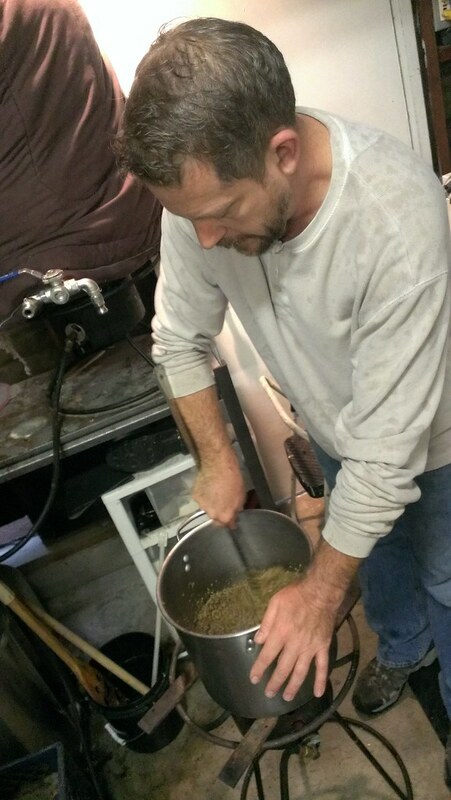 For our next collaboration / Scott education project we are looking at doing a turbid mash to brew some lambics. Until next time.